How many times have you eaten something new or food that you were familiar with from the grocery store and you just didn’t like it? I’m betting you can count a few times on one hand in your lifetime but I want to know, what do you do about it? Today, I’m going to walk you through exactly how we would return food to a grocery store including what we would say and do. When I first moved to Canada there was no way in hell I was returning anything food or not. In fact, I had no idea how to grocery shop in Canada which meant I was starting from scratch. I’m not alone, this happens every day even with people born and raised here. Today, my views and experience have greatly changed only because my wife motivated me to get in there and do it myself. Sometimes it’s hard to return something when you aren’t familiar with the process or you don’t want to look like a fool. Trust me, you won’t. I hope this offers a bit of inspiration to those of you who hesitate or feel cheap about doing something like this. Don’t be, it’s your money and you should be getting the best quality even if it is no-name brand products you buy. 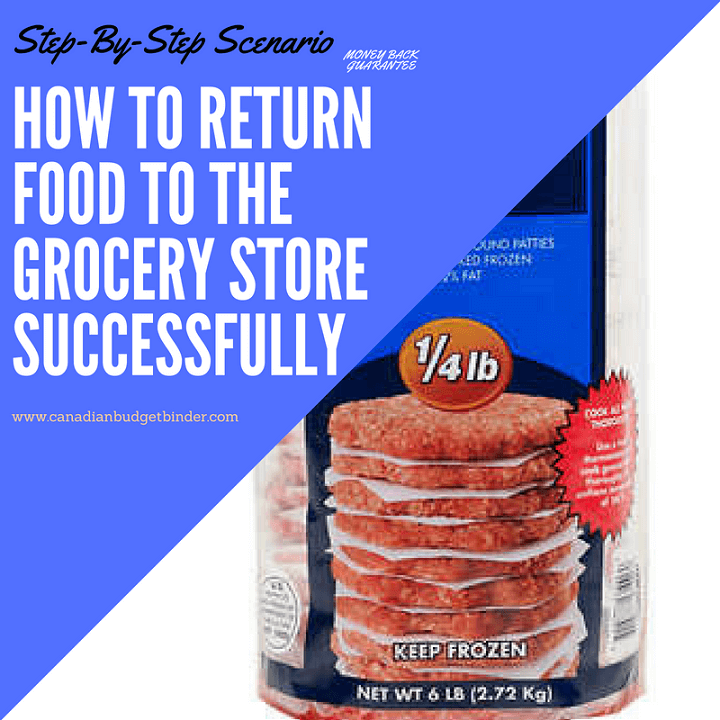 Return it- YES you can return food you don’t like to a grocery store depending on their return policy. No one should ever consider food waste as an option of getting rid of food when it is edible and someone else can eat it. Just this week we emptied 3 large freezers of food and donated it all to a family in need. There is always someone out there who WILL eat it even if you don’t like it. I’ve seen numerous times on buy and sell sites people offering up food that they didn’t care for or that is hardly used. People jump on this stuff because it’s FREE and when the money is tight food is food. There is no room for being picky when food is limited and scarce. Obviously if you’ve purchased food and it has gone off before the expiry date that should fuel even more to bring it back to get your money back. Keep in mind that expiry dates differ and just because it says it expires in a day or a week doesn’t necessarily mean it won’t be spoiled ahead of time. I don’t know if you remember but a few weeks back we made a trip to Costco where we purchased Kirkland Burgers for $19.99 on sale with one of those Costco coupons they hand out at the door. Mrs. CBB and I typically make homemade burgers but thought we’d give them a try since we often see Costco customers loading up on them. They can’t be that bad right? WRONG, at least for us. I know there are consumers who just love the Kirkland burgers and like any product you like some, you love some and there are some that will never touch your lips again. They were a horrible mess for us and my brother and sister-in-law agreed since they bought the same bag on sale as we all went together. We did not put them on the BBQ first because we wanted to do the frying pan test which was an epic failure which was enough motivation for us to return them. Sorry Costco but those burgers start out looking like a big beautiful burger and in the end curls up like an upside down turtle shell. Haha, you know what I mean. We didn’t find much flavour at all but when you add condiments who tastes a burger. It must be seasoned correctly though with salt. It tastes like those cheap hamburgers when in fact Kirkland burgers are expensive to buy. This was just another reminder for us that you don’t always get what you pay for and homemade is best. We like to learn and explore products so we can write about them for all of you but the best part about Costco is their return policy. Costco has what we’ve heard one of the best return policies in Canada for everything they sell including their membership if you are not a satisfied customer. Obviously there are some restrictions but for the most part you can bring anything back. Big ticket items like electronics and jewellery you will have 90 days from the date on your receipt to return them. We don’t care about that right now because we’re all about the food today! Costco’s generous return policy for their warehouse also means that those horrible Kirkland burgers will be going back with us the next trip we make to Costco. The bag is open, we do have the receipt but even if we didn’t they would still process it for us. Keep in mind Costco will track your spending and returns so they know what you are doing so they can track those abusing the return policy system they have in place. If you’re returning food on a weekly basis that is half-eaten I”m sure the red flags will start popping up. How can I return an item purchased in a Costco Warehouse? We are pleased to offer what we believe is one of the best return policies in the industry. With a few exceptions, Costco has a 100% satisfaction guarantee on all of our merchandise. If you are not completely satisfied with your Costco purchase, simply return the product to any Costco warehouse. Please include the product packaging if you have it, although we do not require it for a return to be processed. We also prefer that you provide your original receipt, but if it is not available, we will do our best to process your return without it. If you’re not sure you can always Just call 1-800-463-3783 or go to Costco.ca and select Customer Service. Whatever you do, don’t throw out food that you purchased and still have a receipt for because you most likely can bring it back.. Don’t view it as a hassle rather a part of customer service where your grocery store wants to see you as a happy customer. Odds are you will be making another trip to the grocery store for another shop so don’t hesitate to bring along the product(s) that you didn’t care for along with your receipt. This is why I always tell my readers to keep their receipts because they aren’t just a piece of paper they are considered money in your pocket if you don’t like something that you purchased. Thankfully, almost all grocery stores in Canada will take back food that you don’t like with-in a specified time-frame in accordance to their return policy. They may not be as simple as Costco but if you aren’t happy with a product or service most often you just let them know why and they will return your money or offer you an exchange or in-store credit. Zehrs is another grocery store we frequent and any time we’ve wanted to bring back food we didn’t like their return policy gave us no hassle. You must abide by their return policy rules which is comparable to almost all grocery stores in Canada. Returns with Original Receipt: Merchandise may be returned for exchange or refund within 14 days of purchase with original tags and packaging. Exchange only after 14 days. Zehrs also has a “Try It You’ll Love It Guarantee”. The things you learn when you read the FAQ’s of websites. This is the fine print most consumers glance over or don’t read at all but offer valuable information to consumers. It’s your money. Always read the front or back of your receipt which is where most grocery stores put a blurb about returns and exchanges. If you are not sure, look online or make a quick phone call to customer service of the grocery store where you purchased the item. Don’t roll your eyes it takes no time at all. Falling with-in policy time-line bring the product in a bag with the receipt back to the grocery store and head straight to the customer service counter. Customer service: Hi, How can I help you? Customer: Hello, I’d like to return food that we bought which my family did not like. This is when you open your shopping bag and pull out the product to show customer service. Customer Service: No problem sir, Do you have your receipt? In this instance we would also provide our Costco membership card. He/She may ask you about your reasons for the return. Just tell it like it is. Customer: You can tell them more about why you didn’t like a product or just shut your mouth. Typically, only answer when they ask questions unless of course you want to ask your own. Customer Service: Do you have the credit card you used to make this purchase? Yes, or No- Sometimes they will just give you back the cash if no or an in-store credit depending on the grocery store terms and conditions return policy. You may also have to sign your name to a return receipt that they produce for their own records. If for example they deny you their return policy don’t be afraid to escalate and ask if there is a manger on site. Talking to a manager sometimes clears up any confusion especially if the staff member is new and just learning. Customer Service: No problem sir, enjoy your shop. That’s it! It doesn’t have to be complicated at all. Besides, customers service probably does many returns on a daily basis that it’s just procedure. As a consumer you have to remember that grocery stores want your business so they will do anything to keep you coming back, with-in reason. The smaller grocery stores and mom and pop shop variety stores likely won’t be so generous with returns as such but it never hurts to ask, right? I’m off to make an All-Beef Costco hotdog now those are hotdogs!! Delicious! Discussion: What are some food products you’ve returned to a grocery store? Did you have any problems? For example- they declined, you didn’t have a receipt etc. Share your comments in the comment section below. We went over this week but we haven’t touched our Stockpile budget which leaves us the extra $25 in case it is needed. This week was a quick stop to Costco to load up on some sales. With travelling to the inlaws house so much we are trying not to buy more food than we need in our house for now. Oh, we made homemade keto wraps last night and they area amazing and so simple. They sure do, I’m in Ontario. I called for prices first and asked about the Optimum points. Then I high-tailed it into town and earned 45000 points on test strips and syringes. $45 rolls into my grocery budget! We just got her a bunch but she’s on Trillium so I don’t know how that would work. We paid the deductible. We’re still trying to sort it all out as they won’t talk to us. Going through the courts right now. It’s a process I don’t wish on anyone. When I have not been happy with a food product, I contact the manufacturer. The grocery store can only give you back what you have paid, but the manufacturer will usually give extra for your feedback. The last time I had issue was on fresh noodles, they were moldy before the expiry date. I contacted the company and was sent 3 types of their non-perishable noodles. We’ve contacted the company before and was sent a cheque for a refund not thinking we could have returned it to the store as well for a refund. That would be double-dipping and something we wouldn’t do. I do know that companies will offer coupons etc. for feedback on Quality and certainly contacting them is a great suggestion. We had a lovely Victoria Day Weekend…including watering & enjoying our newly planted flower beds & planters. What a difference a splash of color makes! OUR NEXT USA SHOP WILL BE LATER IN MAY…HOPEFULLY! OUR CURRENT TOTAL UNUSED RESERVES ARE $1,743.50. This means the 1,761.30 that we carried forward from 2017 PLUS AN ADDITIONAL $612.27 that we have added in 2018, LESS $630.07 that we have drawn out for use in 2018. I would say…watch my shopping. I never buy anything that isn’t on sale. If it’s not a “loss leader” in the flyer, it’s not on my list. I operate with a huge stockpile of the regularly used items (i.e. canned NO SALT tomatoes) but it’s not unusual for me to buy enough for a 12 week period when there is a good sale. Remember the last time Cloverleaf Tuna in water was on sale for $1 a can…and I bought 30? We go thru that much in 12 weeks. You’ll also notice that I tend to lean towards predominantly vegetarian meals with a little fish/seafood to liven up our weekly meal plan. It’s a lot cheaper than buying packages of chicken, pork and beef these days. You’ll notice that if I do buy an animal protein, it’s definitely not more than once a month and mostly for hubby’s benefit. I make oodles of homemade soups and it’s so easy to fill a soup pot up with all sorts of in season vegetables, a small amount of some sort of protein and lots of seasonings to make it taste yummy. I have done returns at a Grocery store from time to time with good reasons, ie. spoils quickly but I haven’t thought of returning something I didn’t like! Makes sense to me now. Newfound knowledge: Shoppers drug mart gives points on non-prescription pharmacy items like diabetic test strips which really adds up to something on bonus days!